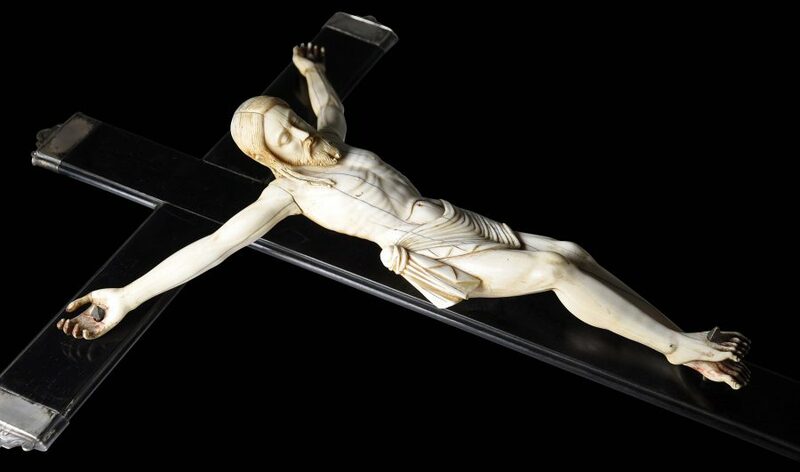 This fine ivory carving of the agonizing Jesus on the Cross is a fine example of early 17th century Christian work done for the Portuguese market in Sri Lanka (Ceylon). 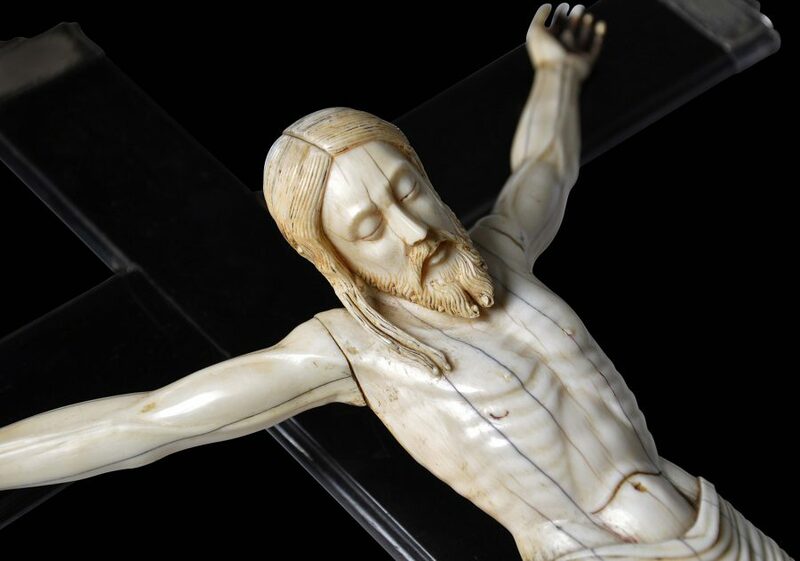 Sri Lankan Christian ivories for the Portuguese market are very rare and particularly early when it comes to Christian art produced in Asia on behalf of European clients. The example here is very similar in motifs, size, and even the fold in the stomach, to an example in a private Portuguese collection illustrated in Baileyet al(2013, p. 124) and attributed to Sri Lanka, 1600-1625. 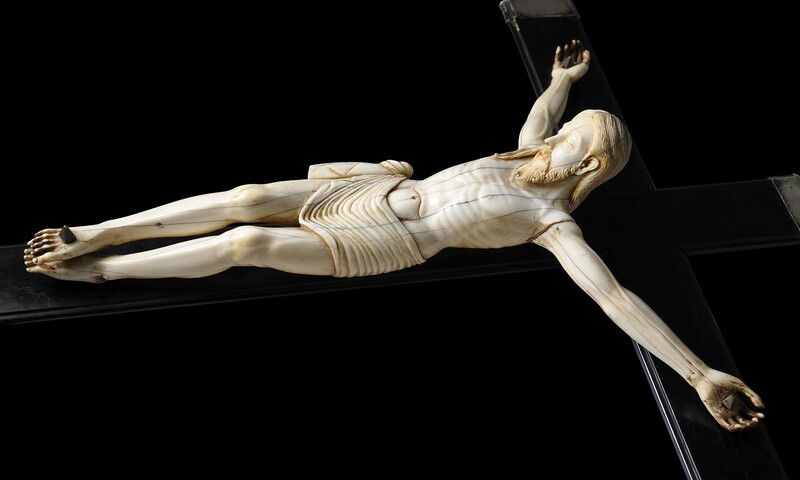 The body of the image is finely and naturalistically rendered with close attention paid to the anatomical features such as the rib cage, the knees, the abdomen and the veins in both arms. The head leans slightly to the figure’s right. The eyes are closed and the expression is somewhat forlorn and exhausted. The beard is copious and ends in two points over the figure’s upper chest. 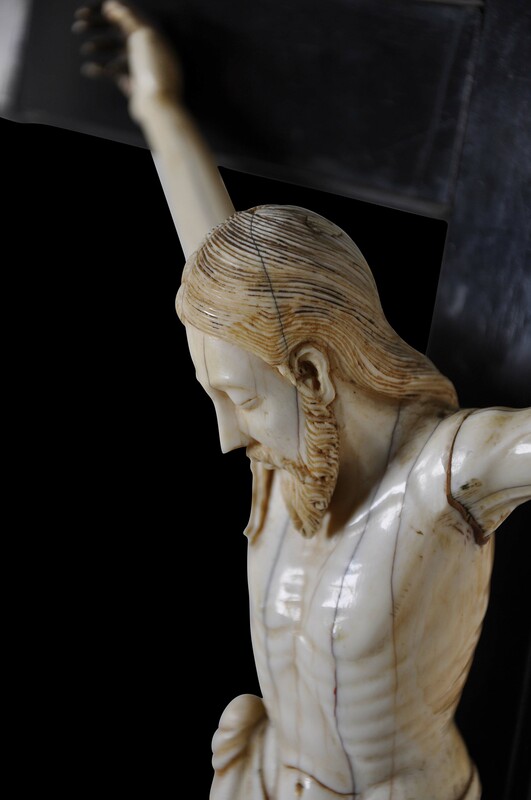 Christ’s right foot is crucified over the left. 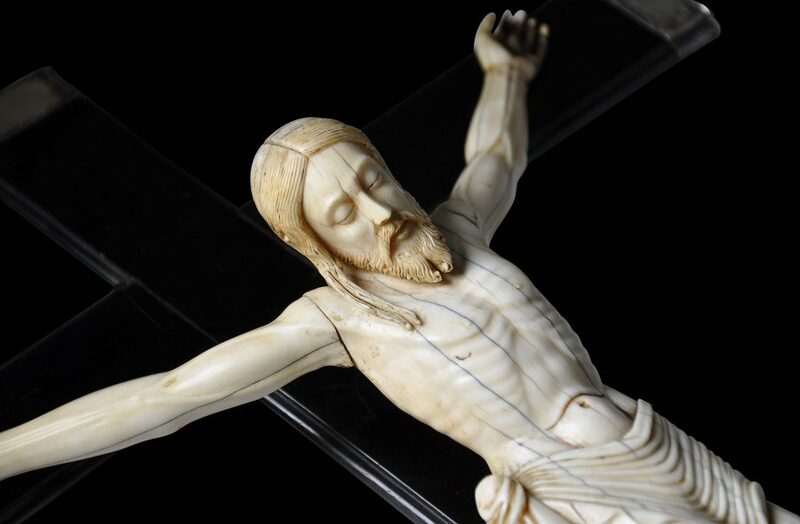 The image’s fingers are intact and remarkably delicate. 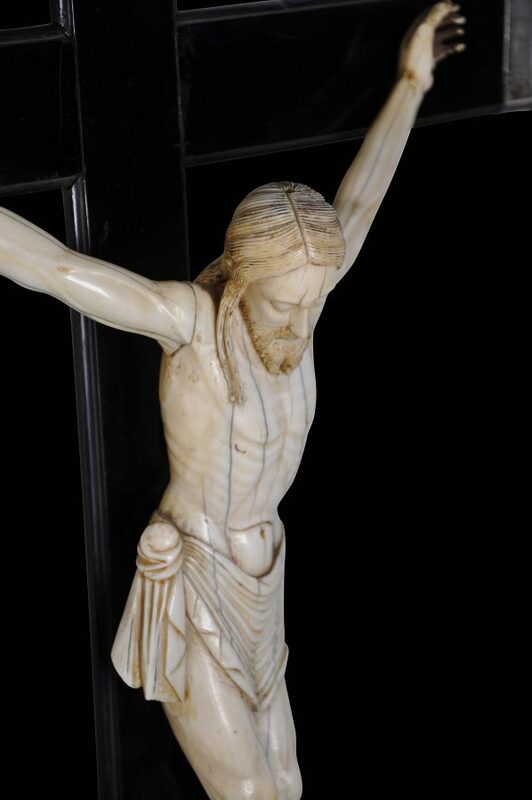 Traces of red polychrome are present and would have been used to suggest blood. A small hole to the top of the head would have allowed a silver halo or crown to be inserted. 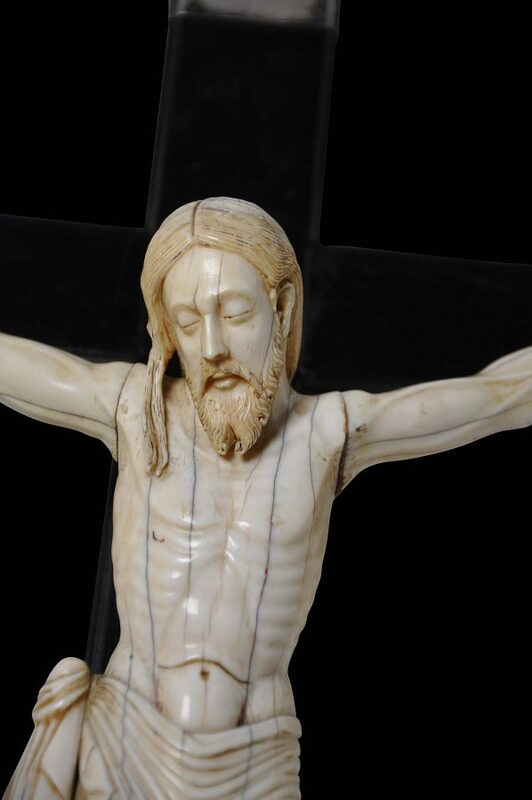 The hair is carved in long strands and falls over the right shoulder only. The loin cloth has multiple folds and has a big bunched knot on the right hip. 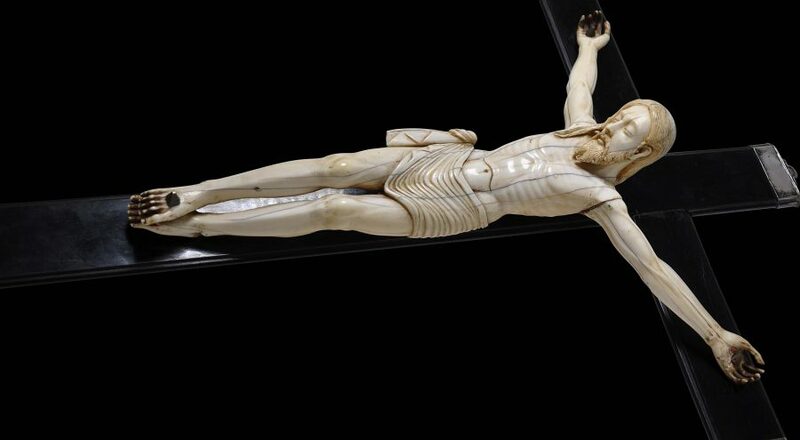 The nails driven through the ivory Christ’s palms and feet are of silver and are in fact screws that hold the image to the crucifix. 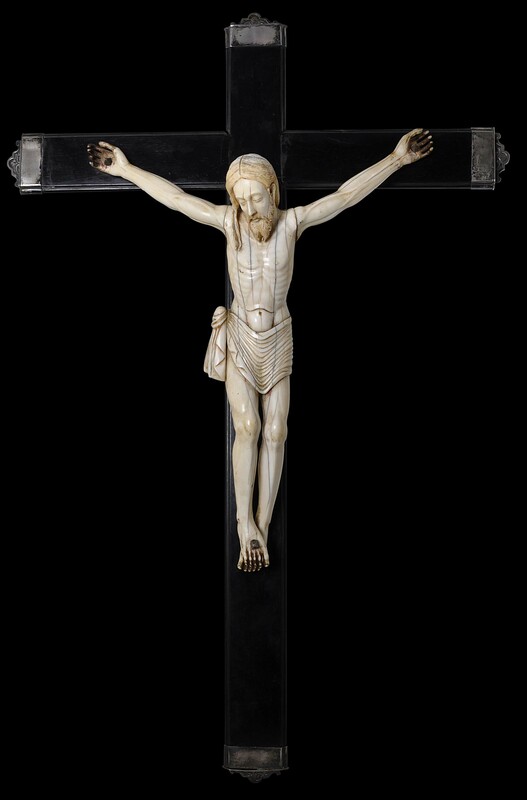 The crucifix of ebony and has engraved silver terminals on all four points. 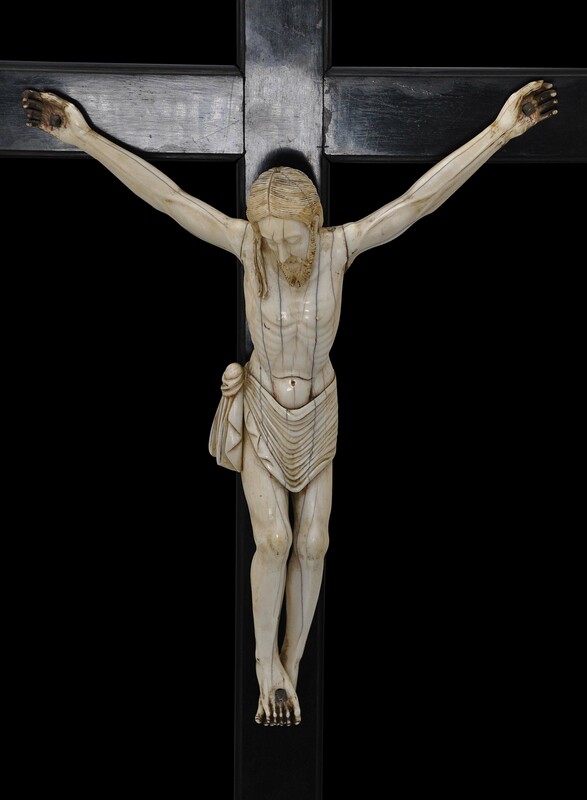 The crucifix might have been produced in Portugal as is often believed to be the case with such Indian and Sri Lankan carved ivory Christ figures for the Portuguese market. 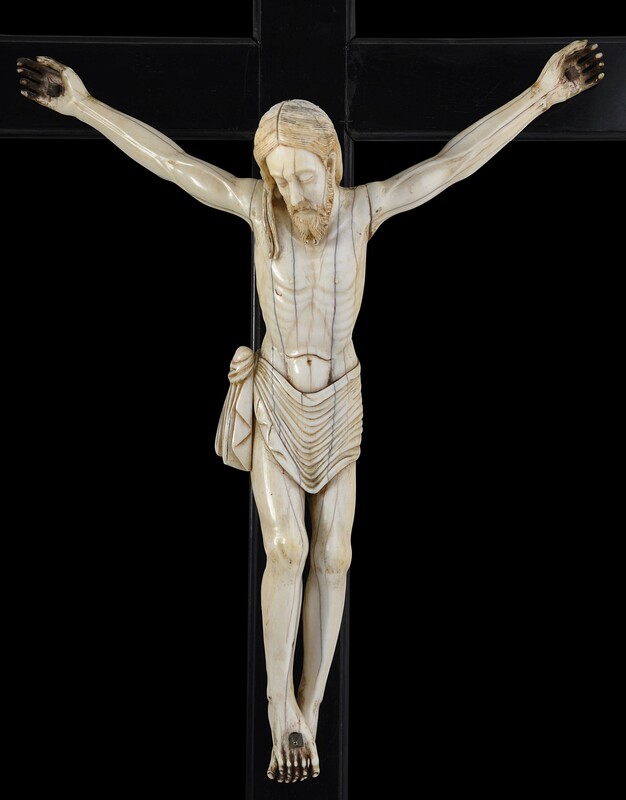 The slight angling of the head downwards and to the right; the large, long face and thin nose; the more European eyes; the styling of the hair as flat but with long strands rather than with waves or curls; the double-tipped beard; the bunching of the loin cloth on the right hip; the prominence of the veins in the arms; and the long, thin body, taken as a whole, point clearly to early Sri Lankan provenance rather than say a Goa, Philippines or Macau provenance. Early on, Sri Lanka was known as a place with numerous elephants and an abundant supply of ivory. The palace workshops of the kingdoms of Kandy and Kotte already were producing fabulous items from carved ivory for the local rulers. 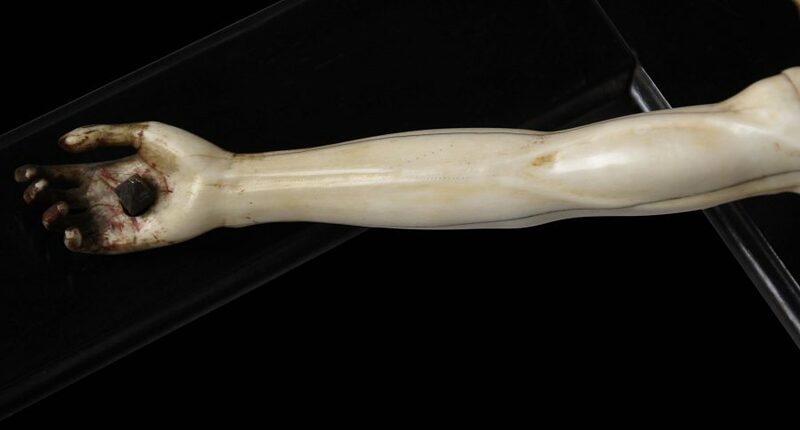 This was recognised by the Portuguese soon after their initial contacts with the island, and it was not long before the island’s ivory carvers began to receive commissions from the Portuguese for items in carved ivory that they could sell into their home market back in Portugal. Christian ivories from South Asia such as this example made their way as direct imports to Europe, particularly to Spain and Portugal, where they entered the treasuries of churches and monasteries. Others were sent to Portugal and Spain’s dominions such as Brazil, Mexico and the Philippines from where they might also have been exported to Europe. 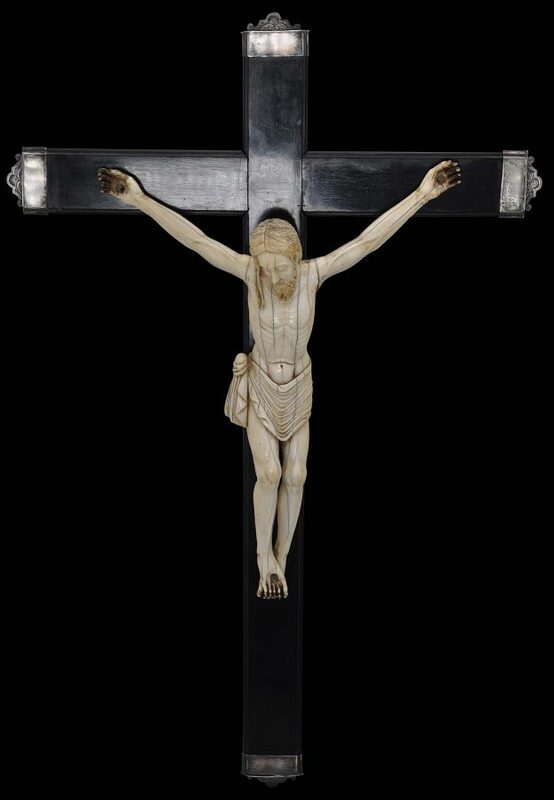 Others still entered aristocratic collections and European cabinets of curiosities as curios and collector’s pieces. Juana de Cordoba y Aragon, the Duchess of Frias, is known to have owned around fifty such pieces in 1604 (Trusted, 2007). 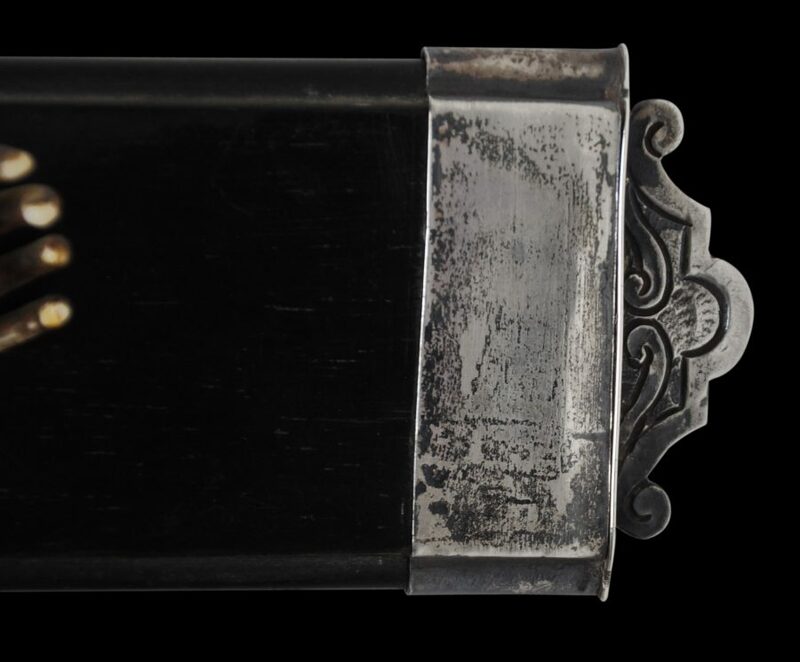 The condition of this piece is exceptional particularly given its size and age. There is a very early addition to the join between the body and left arm to fill a thin gap no doubt caused by shrinkage. 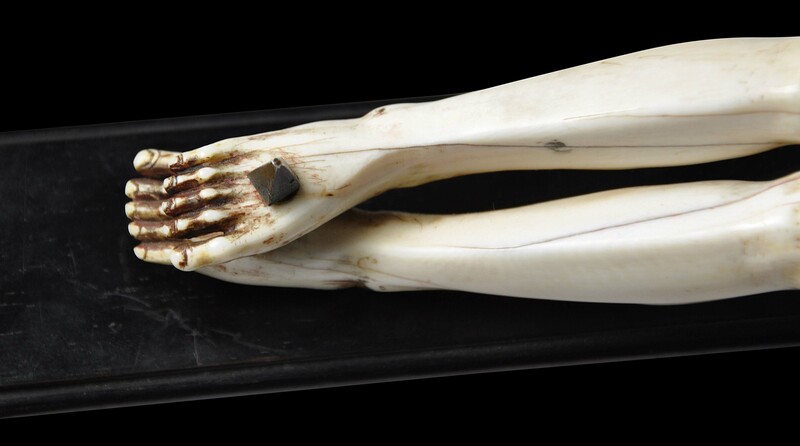 There are no losses to the ivory – even the very fine fingers and toes are intact. Bailey, A., J.M. Massing & N. Vassallo e Silva, Marfins no Imperio Portugues/Ivories in the Portuguese Empire, Scribe, 2013. 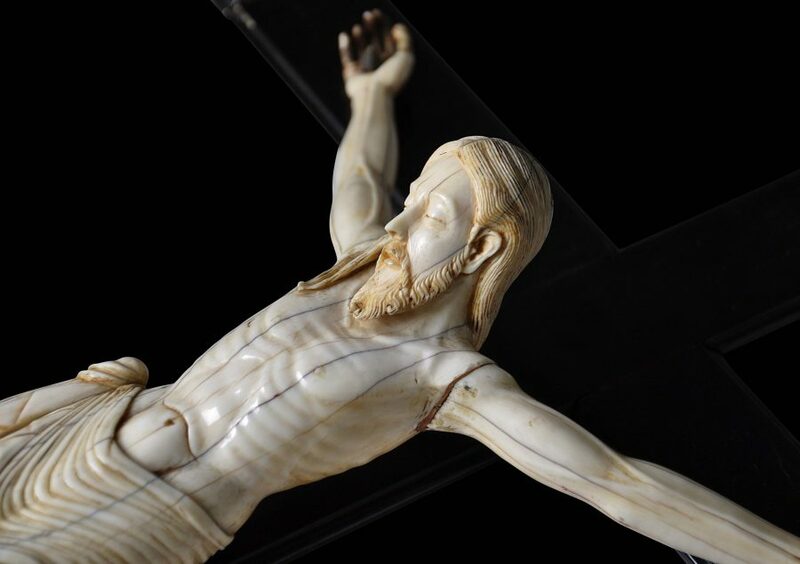 Brazilian Baroque: Decorative and Religious Objects of the Seventeenth and Eighteenth Century, from the Museum of Sacred Art of Sao Paulo, Brazil, Governo do Estado de Sao Paulo, 1972.